As readers of A Girl Called Problem know, one of the central challenges faced by thirteen-year-old Shida in the novel is a traditional belief by some in her village that girls should not attend school. Even one of the teachers at her school holds this belief and makes it difficult for Shida and her female cousins to be there. In my author’s note at the end of the book, I discuss how access to education continues to be a major challenge for many girls in East Africa and other parts of the world. The good news is that many development organizations and leaders are beginning to understand the power of educating girls. 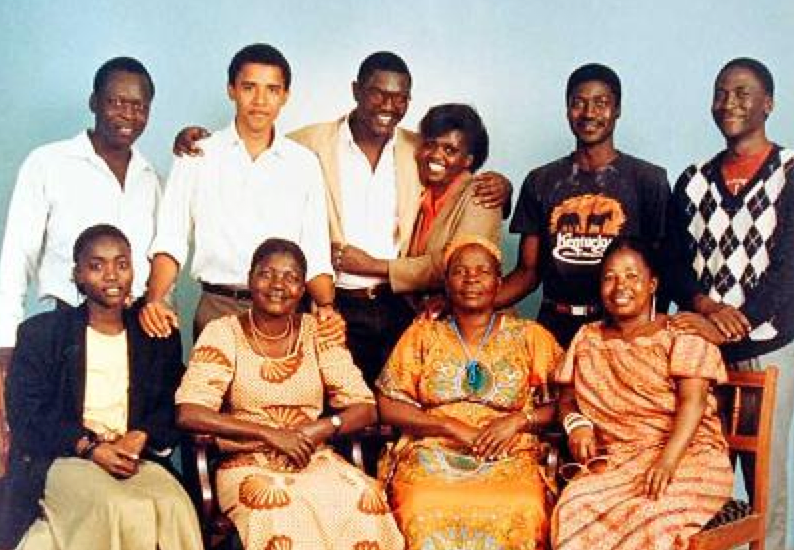 President Barack Obama with his Kenyan family (photo credit: Wikipedia.org). Well, so around the world, there is a tradition of repressing women and treating them differently, and not giving them the same opportunities, and husbands beating their wives, and children not being sent to school. Those are traditions. Treating women and girls as second-class citizens, those are bad traditions. They need to change. They’re holding you back. Any nation that fails to educate its girls or employ its women and allow them to maximize their potential is doomed to fall behind the global economy. We’re in a sports center: imagine if you have a team and don’t let half of the team play. That’s stupid. That makes no sense. As the first Kenyan-American president, Obama is in a good position to offer this critique, and, citing the United State’s reexamination of the confederate flag, he was quick to point out that all societies have bad traditions that hold them back. Shida would have been standing up and clapping throughout his speech! Here’s the full speech. For the section where Obama focuses on girls, listen to minutes 27-33. This entry was posted in A Girl Called Problem and tagged A Girl Called Problem, bad traditions, confederate flag, educating girls, education, Kenya, Kenyan-American president, Obama, second-class citizens, women and girls. Bookmark the permalink. Great speech! I hope it really helps to bring about change. Katie, I’m not sure if I told you back when I finished and reviewed your book, but I loved ‘A Girl Called Problem.’ Shida’s story stays with me still. Thanks so much for your comment and review, Marcia. Praise coming from a writer as accomplished as you are is much appreciated. Happy fall!